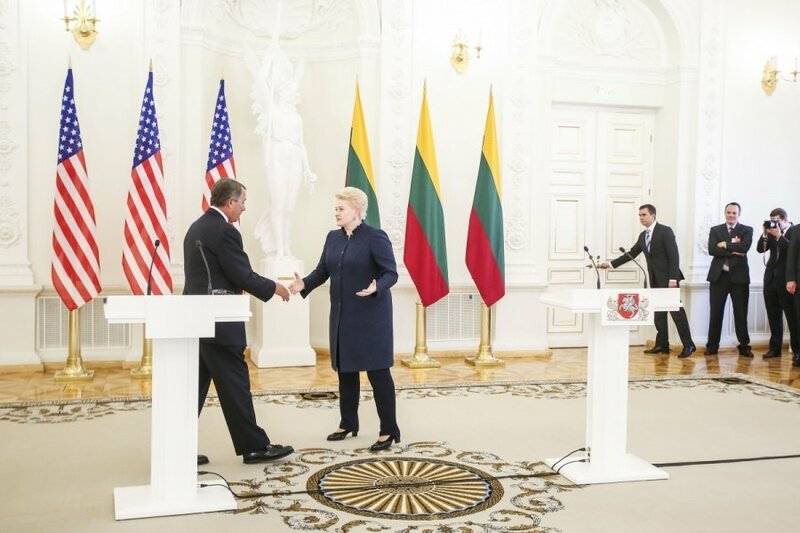 Lithuania supports efforts to reach, as soon as possible, an EU-US free trade agreement that will boost bilateral trade and will further strengthen transatlantic relations, Lithuanian President Dalia Grybauskaitė said after meeting with John Boehner, the Speaker of the US House of Representatives, in Vilnius on Saturday. "A very important area with the United States is EU cooperation and talks on a free trade agreement. Lithuania supports US and EU efforts to reach a deal as soon as possible, because this agreement will bring benefits to both economic partners - the entire European Union, including Lithuania, and the United States," she told reporters after the meeting. According to the president, Lithuania is among the strongest supporters of an EU-US free trade agreement, with as much as 79 percent of people in the country favoring it. European and US negotiators have been negotiating on the world's largest free trade and investment agreement for more than a year now. The pact would create a single market of one billion consumers spanning half the globe, harmonizing regulations and removing tariffs from Alaska to the Baltic Sea. Before such a free trade agreement is signed, it is very important that the US should ease the export of energy resources, including liquefied gas, to Europe as soon as possible, Grybauskaitė said. The president said that such a decision by the US would not only change Europe's energy market, but would also have an impact on the geopolitical situation in the region. "This would make it possible to purchase shale gas and supply it to Lithuania via our LNG terminal at even more favorable prices," she told reporters. Lithuanian Foreign Minister Linas Linkevičius said in early March that Lithuania might become the first country to receive liquefied gas from the United States, adding that given the agreements being signed, this could happen in early 2016. Lithuania's natural gas supply and trading company Litgas last February signed a master trade agreement with Cheniere Energy. The first shipments of LNG from the US energy company may be delivered to Lithuania as early as in 2016. Litgas has also signed a memorandum of understanding with Delfin LNG, the first offshore floating natural gas liquefaction project in the United States. It is estimated that projects being developed in the United States may increase the output of LNG by 30 billion cubic meters per year by 2018, which accounts for around 10 percent of the existing global LNG market. By comparison, the Baltic countries use about 4 billion cubic meters of natural gas annually.